I’m the littlest grey at 11.2hh, the cutest, and the favorite to dress up at the holiday courses and enjoy pony parties. I take very good care of my little riders, I have a cute neigh and I love lollies at pony partys. I’m 13.1hh, a dark bay and strong willed. Boys love me but so do the girls. I’m cool because I’m straightforward and will happily lead you to the feed room for treats, I talk every time you come by my paddock in hope you will pick me. I have a bit of sass at times but am generally a loving good natured pony who loves to do a bit of everything. My size is deceptive - I am 13.2. 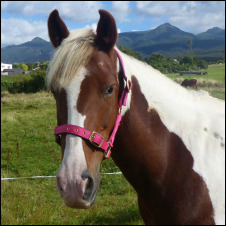 I'm a bay 14.1hh gelding, I'm really sweet, I love hugs, I'm very good with timid riders and I'm blind in one eye not that it bothers me. I’m a painted pony with a bit of spirit. I love to go out on the farm as well as to jump. I like cuddles and to be loved. I'm 13h. At 15.1 I’m the biggest, but gentle and a grey. I’m the boss of the paddock, have great movements and I’m always clean.